Landing Pages with countdown timers are very cool. These countdown clocks and timers help improve conversion rates because people actually get anxious waiting for your content. They are a good strategy to implement and you also get a chance to connect with your audience even without a website! While you are in the process of creating a new website you have the ability to inform the public that you are curreting working on the new website and give them a timetable. My personal favourite about these landing pages is the beauty of its simplicity. Clearly states that you are getting here and make people happy about it. 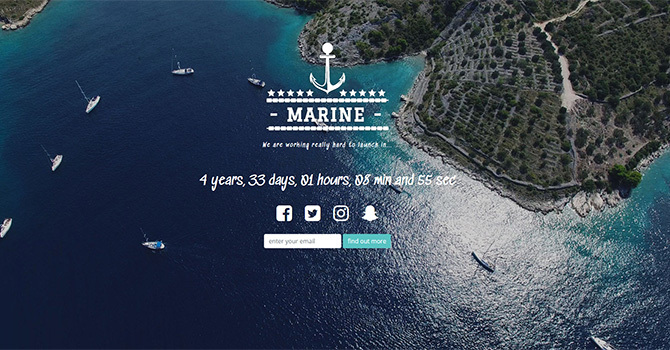 I created this beautifull landing page page with a countdown so that you have something beautiful as long as I develop your website. I can of course customize it to the max, but this is the core idea of this design. So check it out! Credits for the counter to rendro. You rock!